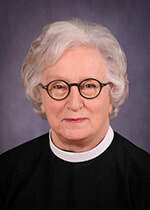 Dot Hospador is a life-long Episcopalian. She was born and raised in Perth Amboy. The joys of her life are her son, daughter and her three grandchildren. Dot was ordained a Deacon in the Episcopal Church by Bishop Chip Stokes on May 9, 2015. She was previously at St. Mark’s in Keansburg helping to feed those in need. On July 11, 1987, Dot entered the program of Alcoholics Anonymous and has over 28 years of sobriety. Active in the program, she attends meetings and has had the same sponsor for all her time in the program.